Abstract. The light-absorbing organic aerosol (OA) commonly referred to as “brown carbon” (BrC) has attracted considerable attention in recent years because of its potential to affect atmospheric radiation balance, especially in the ultraviolet region and thus impact photochemical processes. A growing amount of data has indicated that BrC is prevalent in the atmosphere, which has motivated numerous laboratory and field studies; however, our understanding of the relationship between the chemical composition and optical properties of BrC remains limited. We conducted chamber experiments to investigate the effect of various volatile organic carbon (VOC) precursors, NOx concentrations, photolysis time, and relative humidity (RH) on the light absorption of selected secondary organic aerosols (SOA). 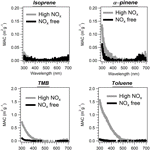 Light absorption of chamber-generated SOA samples, especially aromatic SOA, was found to increase with NOx concentration, at moderate RH, and for the shortest photolysis aging times. 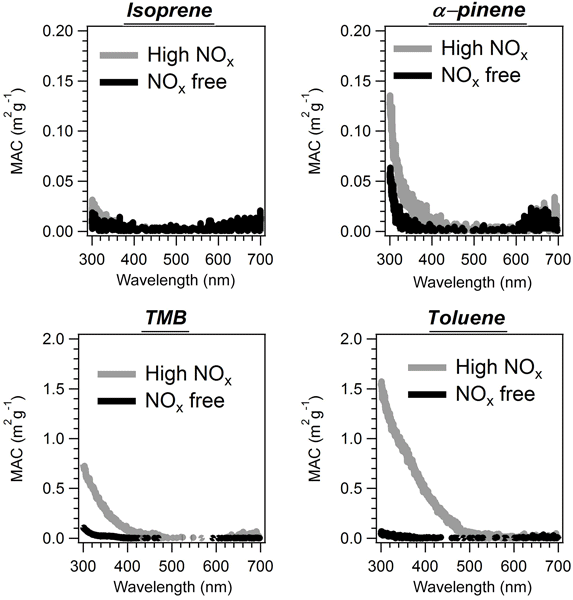 The highest mass absorption coefficient (MAC) value is observed from toluene SOA products formed under high-NOx conditions at moderate RH, in which nitro-aromatics were previously identified as the major light-absorbing compounds. BrC light absorption is observed to decrease with photolysis time, correlated with a decline of the organic nitrate fraction of SOA. SOA formed from mixtures of aromatics and isoprene absorb less visible (Vis) and ultraviolet (UV) light than SOA formed from aromatic precursors alone on a mass basis. However, the mixed SOA absorption was underestimated when optical properties were predicted using a two-product SOA formation model, as done in many current climate models. Further investigation, including analysis on detailed mechanisms, are required to explain the discrepancy. How to cite: Liu, J., Lin, P., Laskin, A., Laskin, J., Kathmann, S. M., Wise, M., Caylor, R., Imholt, F., Selimovic, V., and Shilling, J. E.: Optical properties and aging of light-absorbing secondary organic aerosol, Atmos. Chem. Phys., 16, 12815-12827, https://doi.org/10.5194/acp-16-12815-2016, 2016. Light absorbing organic aerosols (BrC) absorb sunlight thereby influencing climate; however, understanding of the link between their optical properties and environmental variables remains limited. Our chamber experiment results suggest that variables including NOx concentration, RH level, and photolysis time have considerable influence on secondary BrC optical properties. The results contribute to a more accurate characterization of the impacts of aerosols on climate, especially in urban areas.